evolution of the original sock-fit model, the newest adidas Shoes features a single Primeknit layer on the upper with a woven stripe motif, accented with embroidered vamp details. The signature NMD Boost midsole is then refined with a sharper look and deconstructed EVA insert on the side panel while engraved with details on the lateral side. Dressed in a navy blue colorway and finished with a contrast collar and signature tape heel tab, this pair of shoes is rounded out with a stripping footwear design to match the silhouettes canvas. Releasing later on this month, here’s a good look at the two pairs that make up the adidas Shoes 2018 Gore-Tex Pack.adidas upgrades the lightweight and breathable model by making it more suitable for the cold winter season. The do this by having the shoe’s upper constructed out of a Gore-Tex material that will help keep you dry and warm. 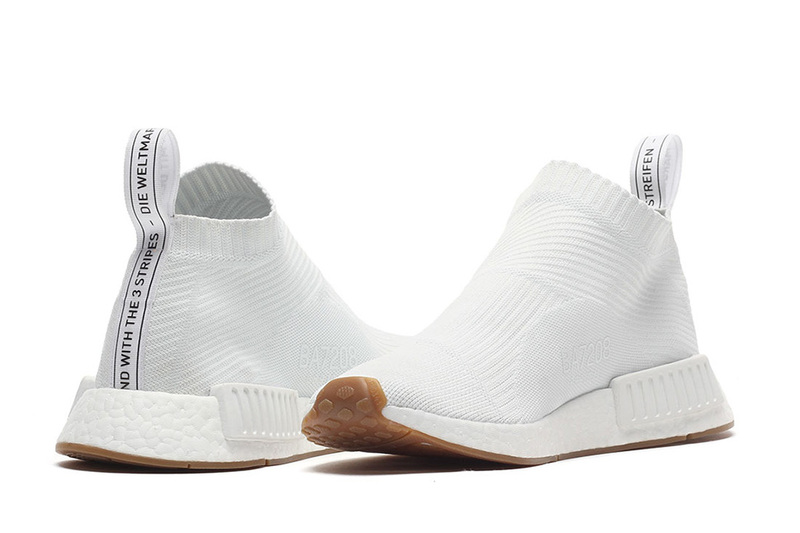 The adidas NMD CS1 Gore-Tex Pack comes in your choice of Black and White or White and Black. The tonal Primeknit uppers are offset by contrasting Boost midsoles and EVA inserts. Featured in its official imagery, the sneaker’s adidas nmd cs1 chukka-esque profile is defined by its minimalist aesthetic with a full black primeknit construction. The focal point on this pair is directed at the inner lateral section and heel tabs which reveals Japanese text as a nod to the respective label.Additional Japanese lettering is seen on the frontal EVA insert, while a clean white boost midsole unit and gum outsole caps off the sleek and simple design altogether. Following a recent first look at its tonal adidas nmd cs1 pk white black/white iteration, the new adidas NMD City Sock is unveiled in another variation this season. Essentially a mid-cut rendition of the newly-introduced silhouette, the model dubbed, NMD_CS1, is inspired by contemporary functional designs and high-fashion sensibilities. Compared to its traditional build, this pair utilizes a sock-fit Primeknit textile upper in a clean striped motif in timeless shades of black and white. All resting atop a full-length Boost midsole unit with referential EVA inserts in its respective colorway.